A prepacked polymer modified, fibre reinforced lightweight cementitious based mortar designed for the restoration of spalled and damaged concrete where formwork cannot be utilised. A durable system which affords maximum protection to embedded reinforcement. Can be applied to a thickness of up to 50mm in a single application on a vertical surface. Independently tested by Taywood Engineering Limited and complies with the DTp specification BD27/86 clause 6. Nucem H.B. Mortar has been specially formulated to achieve and surpass the performance requirements of EN1504 Part 3 Class R3. 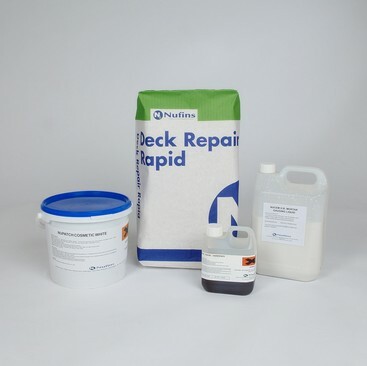 Repair of concrete damaged by reinforcement corrosion or fire damage. Repairs to spalled columns, beams and soffits. Waterproof render to concrete, brickwork and blockwork. Pack contains everything required including gauging liquid. Aggregate is non-Alkali Silica reactive in accordance with ASTM C289. Good resistance to water, frost and salt permeation. Can be laid in sections from 10mm upwards. Based on shrinkage compensated Portland Cements. Low chromate (CR VI <2ppm). To download the Nucem H.B. Mortar Technical Data Sheet click here. To download the Nucem H.B. Mortar Safety Data Sheet click here.